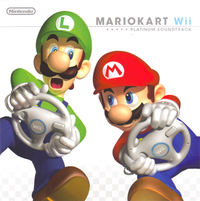 The Mario Kart Wii Platinum Soundtrack is the official soundtrack CD to Mario Kart Wii, containing 43 music tracks from the game composed jointly by Asuka Hayazaki and Ryo Nagamatsu. It was released in Japan in December 2011 exclusively as a reward obtainable through the Club Nintendo customer loyalty program. This page was last edited on February 8, 2019, at 01:07.